Thanks and props to ‘DieselGeek’ for alot of help getting this info together! You da man.Also– if you haven’t already, please read the ‘disclaimer’ at the top of the parent page here. Get your 86-93 Fox Body Mustang up and running in minutes! We now have a MSPNP Generation 2 out for ’86-’93 5.0 Mustangs and ’94-’95 Mustangs! These are a fully loaded plug and play package with plenty of extra inputs and outputs, including headphone output for listening to a knock sensor, a 4 bar MAP sensor for massive boost levels, output for a boost control valve, peak and hold injector drivers, and more! 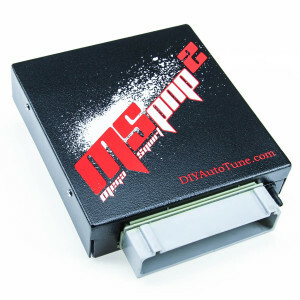 The MSPNP comes with a software CD, base map for a lightly modified 5.0, and tuning cable. This is our most powerful production plug and play system for Mustangs yet! Ditch the MAF restriction, and tune it to perfection! Click here for to order yours today! Check out the MSPNP Page for more information. These have TFI modules on the distributor (86-93) or remotely mounted (94-95). You can do these using the PIP wire on the TFI distributor as the tach input to MegaSquirt-I running MSnS-E firmware, or a MegaSquirt-II running the standard MS2 firmware. More information on each implementation and any modifications required are below. On all of these Mustangs, Megasquirt allows you to completely remove the EEC-IV ECU and replace it with the MegaSquirt. The MegaSquirt can take over all of the functions except some of the emissions control devices. Basically you get the TACH input to the MegaSquirt (pin 24) from the PIP signal on the TFI module, and you send the outgoing MS ignition signal back out from pin 36 to the SPOUT pin on the TFI module. You can use the Megasquirt to control the TFI module, which is quite straightforward. Or if you want to give your system the ability to cut the fuel, you can control an MSD box or the coil directly, bypassing the TFI module on the output side. On SN95 Mustangs, you can use the MegaSquirt to remove the stock ECU if you have a manual tranmsission. You only need to keep the stock ECU if you are running an automatic, since MegaSquirt does not have transmission control outputs. Alternatively, you can use a MegaSquirt to control the engine and a MicroSquirt or GPIO board to control the transmission. Based on a remote mount TFI Module and a separate distributor. Same story as the 87-93 for the most part, you just get the return the signals to different places. Basically you get the TACH input to the MegaSquirt (pin 24) from the PIP signal on the TFI module, and you send the outgoing MS ignition signal back out from pin 36 to the SPOUT pin on the TFI module. Thanks to ‘MegaScott’ on the MSEFI.com forums for this drawing and permission to use it here. Almost any MS variant can be used on these cars with full fuel and ignition control. The MS2 adds more precise fuel and timing control with a faster processor, while MS3 opens up even more options, including full sequential EFI with the stock distributor. This setup drives the MSD box through a BIP373 transistor (for a V3.0 board) or 2N2222A (for a V2.2) and works with the stock Ford fast idle valve. The V3.0 version can also drive a coil directly. Output mod: Run a jumper wire from the negative lead of LED 17 to jumper X11. Fast idle mod: Replace transistor Q5 with a TIP120/121/122 power Darlington, as shown on our MK-PWMIAC catalog page. Input mod: You install a 1k 1/4w resistor in place of D2. Jumper TachSelect to OptoIn, XG1 to XG2, and TSEL to OptoOut. Install Q16 if it is not already installed (Our units will have this already soldered in). Cut out R57 if fitted (This won’t be there on my units, though). Remove R39 and install a jumper in its place. Install a TIP120/121/122 in place of Q4. For more information, see our MK-PWMIAC page. The MSD box will control the dwell. Here is an external wiring diagram for the V3.0 board. V2.2 wiring is identical except that you will connect the MSD white wire to pin 25 instead of 36. Note that the fuses and relays are already in the stock wiring, so you will not need to change these. The injector configuration shown is intended to promote smooth flow through the fuel rails and is one of several possible ways to wire the injectors. 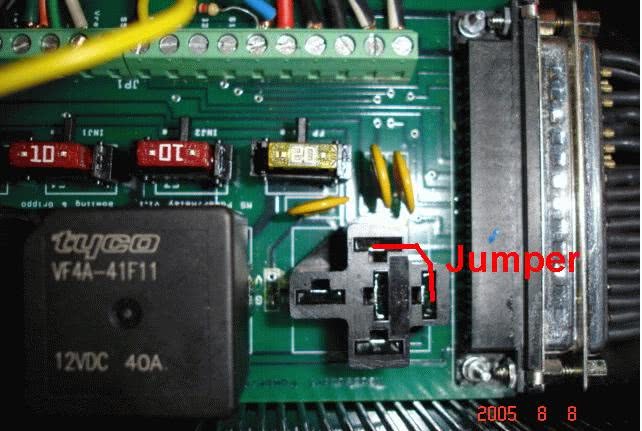 Run a jumper wire from the negative lead of LED 17 to jumper X11. 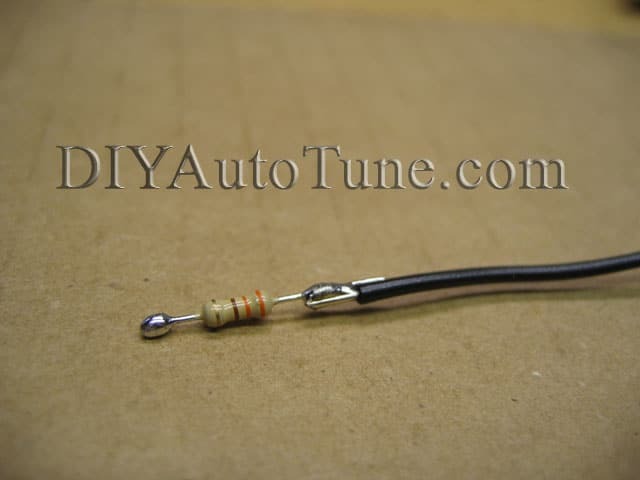 Get a 1k ohm 1/4w resistor and cut the leads down to about 1/2″ at each end. Maybe a bit less. Melt the tinned wire tip to one end of the tinned 1K ohm resistor tip and let it cool. Use this wire/resistor combo to jumper the negative lead of LED17 to the left pin (as viewed from the top of the board) of U5 to add a 12 volt pull-up. Run a jumper wire from the lead of D14 nearest the DB9 connector to the IGN jumper. Wrap a 1k resistor in a length of heat shrink tubing, about 1″ long, so that the leads of the resistor stick out both ends of the tubing. Use this insulated resistor to connect the S12 jumper hole to the IGN jumper to provide a 12 volt pull-up on the ignition output. 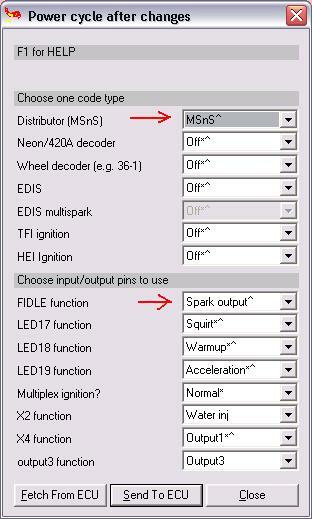 Configure TunerStudio for TFI Spark Output using LED17 (D14). Set Trigger Angle to 10 degrees. Set Dwell to Fixed Duty, and Spark Output Duty Cycle to 50% duty cycle. Here is an external wiring diagram for the V3.0 board. V2.2 wiring is identical except that you will connect the TFI SPOUT signal to pin 25 instead of 36. Note that the fuses and relays are already in the stock wiring, so you will not need to change these. The injector configuration shown is intended to promote smooth flow through the fuel rails and is one of several possible ways to wire the injectors. This is an older setup that is somewhat easier to build, but does not offer fast idle support, nor does it use quite as reliable a transistor to drive the MSD box as the BIP373. Output Mod: None Required when using MSD 6a Box. Thanks to ‘stangdrvr’ for the drawings and notes and permission to use them here! 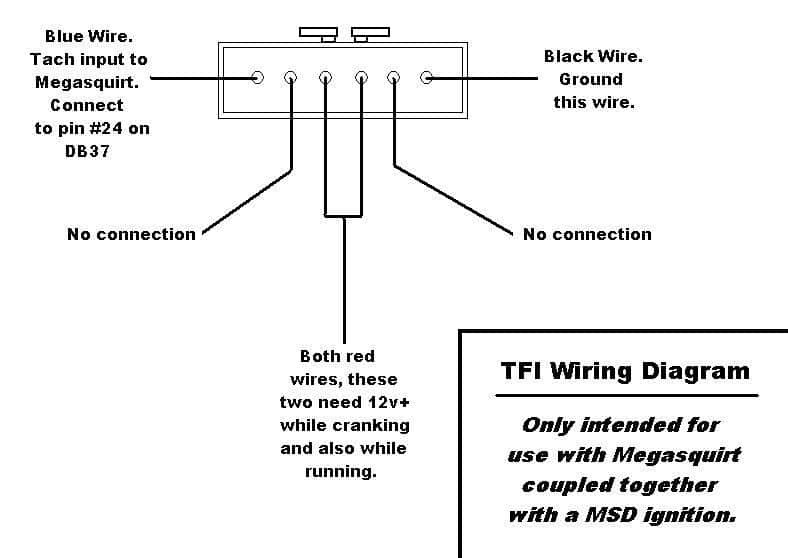 These diagrams are very useful if you are planning on running your MegaSquirt using a MSD 6a box to provide the ignition signal. A1 = Connect to oxygen sensor, LM-1, or LC-1 output. B2 = Connect to blue wire from TFI module. C3 = Connect to coil outputs from MSD. D4 = Connect to white wire from MSD. For the most part, stick with the standard assembly documentation. We’ll cover any differentiation from that doc here. Step 22: You really don’t need any of the 5 jumper wires listed in this step. If you ever use this ECU on a different car that does use a stepper motor IAC you can add them then. Personally, I’d leave them out for your Mustang as you can use the IAC outputs for other cool stuff later. INSTEAD OF JUMPERING D2 as directed here, install a 1k 1/4watt resistor in it’s place. Step 51: You don’t need these components, but I’d recommend installing them anyways in case the MS ECU is ever used on another car with a VR sensor. Step 52: Set the jumpers for Hall/Optical/Points. That would be XG1 to XG2, OPTOIN to TACHSELECT, and TSEL toOPTOOUT. Step 59: You will be doing the PWM Idle Mod using the parts from the mk-PWMIAC. That means you leave D8 out when you get to this step. Step 62: Follow the steps in the blue box following step 62 to finish installing the mk-PWMIAC for control of your 2-wire idle valve. Step 65: You ARE USING THE IGBT High Current Ignition Driver Circuit (MK-BIP373 or other switching transistor required). That means you complete step 65. Install everything just as this step directs you to (which does mean no R57), and install the jumpers to enable the circuit. (IGBTIN to JS10 and IGBTOUTto IGN) Note that if you are using a metal backed transistor like a BIP373 or certain switching transistors, you must use a mica insulator under Q16. NOTE– there was originally an error in the MS2 TFI docs that said to leave R43 out for this setup, I’ve found that to be incorrect and it’s been corrected it in the MS2 docs, so LEAVE R43 in! Step 69: Choice time — Install the PWM Flyback Circuit bits…. Step 71: Choice time — Install the current limit circuit for FET protection…. Now for the final step (Mod for TFI Ignition Output). Use a 100ohm, 1/4watt resistor. Solder one leg of this to the IGN/IGBTOUT jumper wire. Solder the other leg of this to the hole labeled S12. (Not to be confused with the hole labeled S12C !) The S12 label is on TOP of the board, but you’ll place this resistor on the bottom generally. Check out this diagram. That’s it– you’ve got your Megasquirt-II Engine Management System fully prepared to receive the ignition input from your TFI module, and return the Megasquirt controlled ignition output back to the TFI module giving you full control of your stock TFI ignition system. At the same time you’ve also ‘modded’ the FIDLE output to be able to handle your Pulse-Width Modulated (PWM) Idle-Air-Controller (IAC). There will be a jumper wire in the D2 position. Remove this jumper wire and place a 1k 1/4 watt resistor in this position instead. Use a 100ohm, 1/4watt resistor. Solder one leg of this to the IGN/IGBTOUT jumper wire. Solder the other leg of this to the hole labeled S12. (Not to be confused with the hole labeled S12C !) The S12 label is on TOP of the board, but you’ll place this resistor on the bottom generally. Check out this diagram. Jumper J1 to the 3-4 position and JP1 to the 1-2 position. There will be a jumper wire from JS10 over to the center hole of Q16. Desolder and remove this (don’t just cut it, you’ll need the holes clear of solder). Rewire this jumper so it goes from JS10 to IGBTIN. Install a BIP373 with mica insulator in the Q16 slot. Use a 100ohm, 1/4watt resistor. Solder one leg of this to the center hole of Q16. Solder the other leg of this to the hole labeled S12. (Not to be confused with the hole labeled S12C !) The S12 label is on TOP of the board, but you’ll place this resistor on the bottom generally. V3.57s do not need to be modified for IAC output. I couldn’t possibly hope to cover all of the wiring information that is so thoroughly covered in the MSExtra Manuals here, and for the most part there’s really no need to. Sensors and Injectors wire up the same on most every vehicle out there… You can use MSExtra’s schematic & wiring section for this information. I’m going to cover the Mustang specific stuff here…. that would be the Ignition Wiring and the PWM IAC valve wiring. Those are the only two missing pieces of the puzzle. To wire this up without the relay board (directly to the ECU), wire up the hot wire from the idle valve to switched 12v+ (hot in RUN), and wire the negative wire from the idle valve directly to pin 30 on the MegaSquirt DB37. To wire this up with the relay board, you will need to jumper the FIDLE relay to take it out of the loop, below is a picture of how to do this. 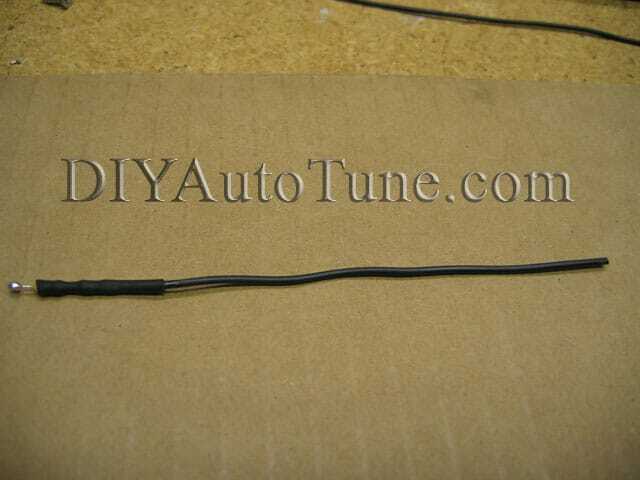 Then you will still wire up the hot wire from the idle valve to switched 12v+ (you could use the fuel pump power from the relay board), and wire the negative wire from the idle valve directly to the FIDLE terminal on the relay board. This will allow full control of your PWM idle valve. You should also put a 1N4001 diode across the PWM Idle valve itself – the banded end goes to the 12 Volt supply, the non-banded end goes to the lead that goes to MegaSquirt (this diode is for flyback purposes on the idle valve). Trigger Angle / Offset should be set at 10 degrees to start. Adjust as needed to make the timing you see with a timing light match the timing in TunerStudio. IAC settings for closed loop can be found in the base map below. You can use your stock IAT and CLT sensors, and with the MegaSquirt-II you can calibrate these sensors through TunerStudio. It’s best to leave the standard R4 and R7 ‘Bias Resistors’ in place in the MegaSquirt and just configure this in the software. You get better accuracy this way. Click OK and the Coolant sensor will be calibrated. You’re not quite finished yet though— You need to repeat these steps, but choose ‘Air Temperature’ as the sensor table and use the same temp and resistance values from above as the sensors use the same curve. This will calibrate the IAT as well. NOTE– Make sure you chose Fahrenheit or your readings will be WAY off with the above values…. For the most part, stick with the standard assembly documentation at MSExtra.com. I’ll just be covering any differentiation from that doc here. Step 65: You ARE USING THE IGBT High Current Ignition Driver Circuit (MK-BIP373 required). That means you complete step 65. Install everything just as this step directs you to (which does mean no R57), and install the jumpers to enable the circuit. (IGBTIN to JS10 and IGBTOUTto IGN) Note that if using a metal backed transistor like a BIP373, you must use a mica insulator under Q16. That’s it– you’ve got your Megasquirt-II Engine Management System fully prepared to receive the ignition input from your TFI module, and return the Megasquirt controlled ignition output out to your MSD 6a CD Ignition box– Giving you full control of your fuel and ignition!. At the same time you’ve also ‘modded’ the FIDLE output to be able to handle your Pulse-Width Modulated (PWM) Idle-Air-Controller (IAC). I couldn’t possibly hope to cover all of the wiring information that is so thoroughly covered in the MSExtra Manuals here, and for the most part there’s really no need to. Sensors and Injectors wire up the same on most every vehicle out there… You can use the MSExtra’s schematics & wiring section for this information. I’m going to cover the Mustang specific stuff here…. that would be the Ignition Wiring and the PWM IAC valve wiring. Those are the only two missing pieces of the puzzle. Note – if you’re not using an MS3X, use the MS2 directions. Follow the standard build guides for MS3, including TachSelect to VRIN and TSEL to VROUT on a V3.0 board. (On a V3.57 board, put main board jumper JP1 in the 1-2 position, and J1 in the 3-4 position). 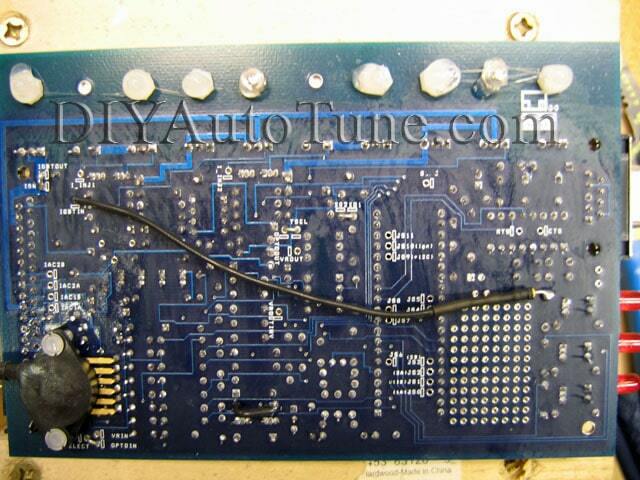 Make sure you have the pull up jumper for 12 volt tach output (JP3 on the MS3X) is across both JP3 pins. I couldn’t possibly hope to cover all of the wiring information that is so thoroughly covered in the MSExtra Manuals here, and for the most part there’s really no need to. Sensors and Injectors wire up the same on most every vehicle out there… With an MS3, use the wiring diagram in the MS3 manual. I’m going to cover the Mustang specific stuff here…. that would be the Ignition Wiring and the PWM IAC valve wiring. Those are the only two missing pieces of the puzzle. Output: Pin 26 on MS3X DB37, connected to SPOUT on distributor. Can also be wired to the white wire of an MSD6 box. To wire this up without the relay board (directly to the ECU), wire up the hot wire from the idle valve to switched 12v+ (hot in RUN), and wire the negative wire from the idle valve directly to pin 9 on the MS3X DB37. This uses the PWM idle driver on the MS3X board. To use signature PIP mode for sequential injection, you need V1.1 or later code. See the MS3 manual on MSExtra.com for more details. Looking for a base map? We’ve now posted a Mustang Base Map for you to download, for MS2/Extra 2.1.0 firmware. Here is a brief rundown of the specs on the test car. This map should be a good starting point for a mildly modified car. The stock ECU controls a couple other devices in these cars besides the injectors, ignition, and IAC valve, but not very much. Here’s what to do about the ones you will need to control. Cooling fans: The ’94-’95 cars generally had two cooling fan control outputs, one for low speed and one for high speed. Use one MK-RelayCtrl mod kit for each of them if you want to control the fans with MS1. See below for a picture of an installed relay control mod kit. If you have an MS2, you can use the two stepper IAC outputs to drive the relays – just wire the two IAC1 wires across the coil of the low speed fan relay, and the IAC2 wires across the coil of the high speed fan relay. The ECU did not control the fans on ’93 and earlier models. Air conditioning: The ECU can turn the A/C off at full throttle, but it does not turn the A/C on. You can use an MK-RelayCtrl if you want to add this function, but the A/C can operate on its own with no intervention from the ECU. It just won’t shut off at full throttle. Automatic transmission: The ’86-’93 models do not have the ECU controlling the transmission, so you can remove the factory ECU completely and not have it affect the shifting. ’94-’95 models have the ECU controlling the automatic transmission. If you have one of these cars, you can either do a parallel installation and leave the stock ECU in charge of the transmission while the MegaSquirt controls everything else, or add a GPIO board running MegaShift. If you’re doing a parallel installation to keep the stock ECU in control of the transmission, see this article for tips on parallel installs. The gauges and air bags on these cars don’t connect to the ECU, so you won’t need to worry about them. The tachometer is driven off the TFI module, so control the TFI module and the tach will follow along. The other gauges connect to their own sending units. The stock intake air temperature sensor threads into the intake manifold, where it can absorb heat through the walls of the manifold. You can compensate for that in your tuning, but it will require more tuning work and know how, and it’s simpler for most to move it somewhere it won’t heatsoak in the first place. Moving it to the intake plumbing upstream of the throttle body (but, on a turbo car, downstream of the intercooler) can give a more accurate reading without the extreme heatsoak concerns. You can use either a Megasquirt I or II on these cars, depending on your budget. You will be able to use your existing sensors except for the MAP sensor which is built into the MegaSquirt. MK-BIP373 is required for many of the mod versions. MK-RelayCtrl will give you a relay control output if you are using an MS1 on a ’94-’95 car, or want to control the AC cutout relay. Note we left a Wideband O2 System OUT of these packages to keep your initial cost down, but as with any engine management system you’ll definitely appreciate a wideband system during tuning. We highly recommend the Innovate LC-1 with or without a gauge.